Today the company has revealed its new flagship devices for 2017, It’s been 10 years since the launch of the very first iPhone. With this they announced the iPhone 8, iPhone 8 Plus, and, most interestingly, the anniversary edition iPhone X. So what's with the new devices? The biggest news of the day is the introduction of the new iPhone X, All the leaks are true regarding Apple’s most impressive and most expensive iPhone to date. It comes with a 5.8-inch edge-to-edge OLED Super Retina display with a resolution of 2438 x 1125 and a pixel density of 458 ppi. The display also supports HDR10 and Dolby Vision. You’ve probably noticed Apple has done away with the home button. This is pretty interesting for a few reasons not only has every iPhone come with a physical home button for navigation purposes, the home button is also where Touch ID lives since the iPhone 5s. Apple seems to have come up with a few solutions for these problems. With the iPhone X, you can just swipe up from the bottom of any screen to go home. Swiping up and holding will get you to multitasking, and you can even swipe along the bottom of the screen to quickly switch between apps. What’s more, Control Center has now been moved to the top of the screen, just like Android’s quick settings implementation.In terms of biometric security, Apple also introduced Face ID, which is a fancy name for the facial recognition tech that will launch with the new iPhone. The iPhone X utilizes a new front-facing TrueDepth camera system, which will process your face scan on-device. Face ID is apparently much more secure than Touch ID, and will be compatible with Apple Pay and third-party applications. Speaking of cameras, the iPhone X sports a dual 12 MP setup on the back with new color filters, a quad-LED two-tone flash, and OIS in both lenses, just like the Note 8. The 12 MP wide-angle sensor sports an f/1.8 aperture, while the telephoto lens comes with an f/2.4 aperture. The iPhone X comes with the aforementioned Portrait Lighting mode, as well as the ability to take Portrait Mode selfies. Because this new device also comes with glass on the front and back, it’s also compatible with Qi wireless charging. Apple is releasing a new charging dock called the AirPower that will allow you to wirelessly charge your iPhone X, Apple Watch Series 3, and AirPods via the new wireless charging case. The AirPower pad will launch next year. The Apple iPhone X will be available in 64GB and 256GB configurations starting at USD999 (roughly Php51,000) without tax. For the folks who are looking to upgrade over last year’s iPhone 7 and 7 Plus, Apple today introduced the iPhone 8 and 8 Plus. The company isn’t going for the more iterative ‘s’ upgrade this year, and that’s for good reason. The iPhone 8 and 8 Plus sport a refined design and upgraded specs over last year’s devices. The devices look similar to the 7 and 7 Plus, they now feature glass on the front and back, complete with an aerospace-grade aluminum frame. Apple actually claims the glass on these new iPhones is the “most durable glass ever in a smartphone” even stronger than the Gorilla Glass. The iPhone 8 and 8 Plus sport 4.7-inch and 5.5-inch displays respectively, along with the company’s new Retina HD display technology with ambient mode similar to the iPad Pro. Both the 8 and 8 Plus come with Apple’s first A11 Bionic chipset, which features a 64-bit six-core CPU (four high-efficiency cores/two performance cores), as well as an Apple-designed GPU that’s supposedly 30 percent faster than the A10 chips of last years flagship. 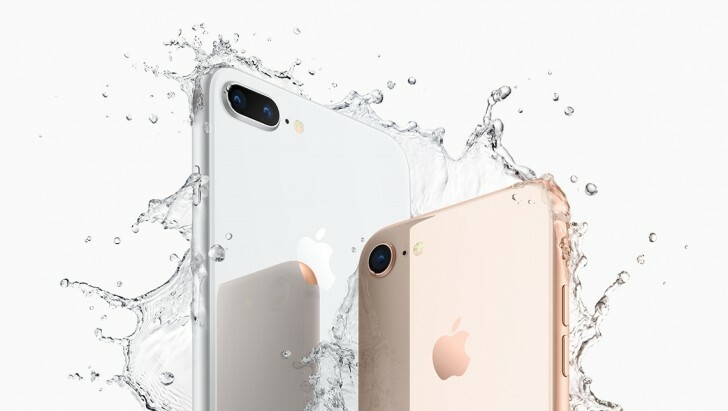 Around back, the iPhone 8 sports a new 12 MP sensor, complete with a new color filter and OIS, while the 8 Plus comes with dual 12 MP sensors with apertures of f/1.8 and f/2.4 competing to the dual camera setup of the Note8. Apple is also introducing a new Portrait Lighting feature, which allows you to change the lighting of your face in Portrait Mode, even before you take the photo and its new camera feature the take your portrait photo to the next level. In addition, the new iPhone 8 phones support slow motion 1080 video recording at 240 fps. The devices support LTE Advanced, Bluetooth 5.0, stereo speakers that are around 25 percent louder than the iPhone 7, as well as support for the Qi wireless charging standard. The iPhone 8 and 8 Plus will be available in two configurations — one with 64GB internal storage and another at 256GB — and will be available starting at USD699 (around Php35,700) and USD799 (roughly Php40,100), respectively without taxes.